Staff was super friendly and helpful. Genius members got a welcome glass of cava! The town itself was fine, the best part being taking long walks along the beach discovering the cool sculptures an artist has put up there. Paz y Mar restaurant on the end of the strip was great too. The Staff and the food are really good! We ve stayed here 7 nights, the price for it was really good. The hotel is near the beach, 5 minutes walk. - It was clean. 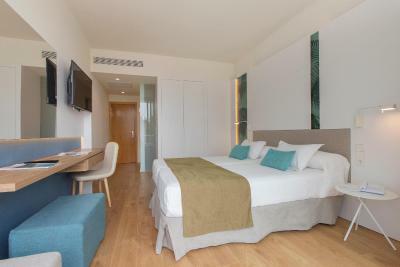 - Well located within walking distance of a pharmacy, restaurants, shops, the beach. 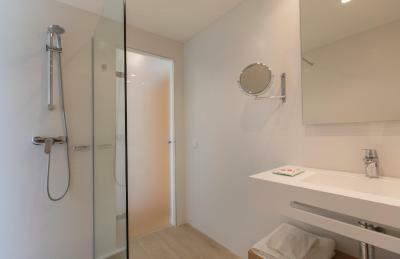 For someone who looks for a place with pool, animation and restaurants nearby in a touristic environment, it is ideal. We got a complementary use of the fridge and a pair of water bottles during our stay. AC works very well with an environmental set that, if you open the window, it stops. Location was good. Close to the beaches and to the restaurants. We had a corner room that was bright and sunny in the morning. location is ok. Close the beach, also not far to bus station if can't driver car like me. food also good. Good location, helpful staff, delicious food, reasonable prices. Perfect from a 3-star hotel! The meal was pretty delicious, thematic dinners each evening. Hotel was located close to the beach, 2 minutes walk. Room had balcony, not exactly sea view, but it was nice. Furniture was older, but bed was comfortable. Js Yate This rating is a reflection of how the property compares to the industry standard when it comes to price, facilities and services available. It's based on a self-evaluation by the property. Use this rating to help choose your stay! 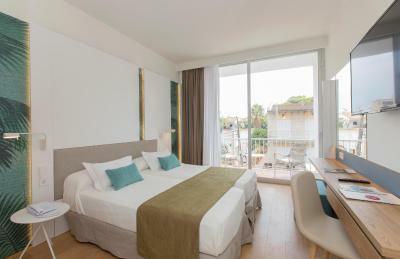 One of our top picks in Can Picafort.Located in the north of Majorca, in Ca'n Picafort, Js Yate is only 350 feet from a fine, sandy beach. It features a large outdoor swimming pool and kids' pool. Free WiFi is provided. Js Yate features a tranquil setting in an area full of shops. From here you can stroll into the town and grab a coffee, before heading to S'Albufera Nature Reserve. Alternatively, for complete relaxation, grab a sun lounger and soak up the sunshine in the gardens surrounding the hotel. There is also a children's playground. 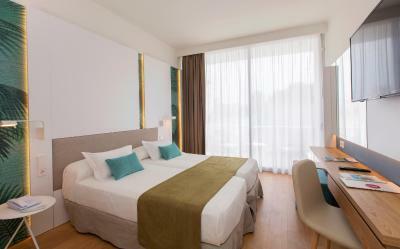 All of the rooms are fully air conditioned and heated. Each one has satellite TV, fridge and a private bathroom with a hairdryer. Safes are available for a surcharge. The Js Yate also offers buffet dining and show cooking at its restaurant, which has great garden views. Snacks are available on the outdoor terrace. When would you like to stay at Js Yate? This air-conditioned room comes with a balcony. It features central heating, satellite TV, fridge and a private bathroom with a hairdryer. A safe is available for a surcharge. 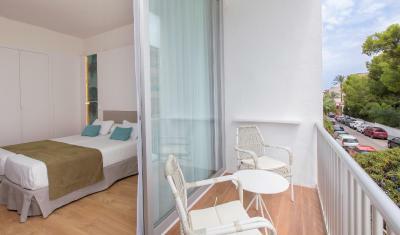 This air-conditioned room features central heating, satellite TV, fridge and a private bathroom with a hairdryer. A safe is available for a surcharge. 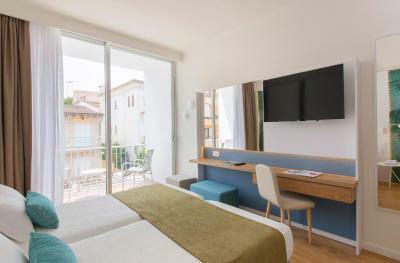 This hotel is in the small & friendly resort of Can Picafort, and it offers All Inclusive... a fantastic way to control your budget whilst on holiday!. House Rules Js Yate takes special requests – add in the next step! Js Yate accepts these cards and reserves the right to temporarily hold an amount prior to arrival. Please inform Js Yate of your expected arrival time in advance. You can use the Special Requests box when booking, or contact the property directly using the contact details in your confirmation. The young lady by reception is not kind, she is not suitable for this work. room is a little small, I think as low price of whole hotel. Wifi was for an extra charge, which in this century seems just outrageous. Good breakfast, clean rooms. They provided slippers, which was a nice surprise. Pool seemed really nice, unfortunately didn't have a chance to jump in. Sun was shining on the pool only in morning. Bit noisy in the evening, if you prefer to go sleep earlier, it could be disturbing. Erika at the reception was very friendly and helpful. I loved the breakfast buffet! Furniture and room was a bit old fashion but clean. Mattress was not the best. Food was great . Friendly staff always ready to help with planning trips and needed thigs. Nice small swiming pool. Very good hotel for nice price close to clear long beach. We would like to come back again. Terrible hard beds. Old bath with curtain. No ventilation in bathroom. Breakfasts were normal, utility of rooms is old but relatively clean. Mixed drinks in all inclusive are only sirup with alcohol, instead of what is written on menu (Mojito for example). Alcohol is only local, but drinkable, otherwise (wine/beer) OK. The lunch package (as supplement for lunch when you rent a car for example) is unacceptable - 1 dry sandwich with ham and cheese, fruit and 1 bottle of water. Very tasty food with various choices. Thematic dinners. 2 minutes to the beach and main shopping/fun street. Quiet location. Friendly staff. The A/C are very old and for such a hot place like Mallorca you would expect them to be better. It was quite hard sleeping at night with the room not being cool enough. I spoke to the hotel they did not even have a fan or offer anything as an option. I was given the “it is what it is” look. For that reason, for the amount of money paid per night, I would not stay there again, just not worth it. Location, just 3 mins walk from the beach. Breakfast was also great with lots of options. Parts of the washbasin have fallen to the ground! We were lucky we weren't hurt as the parts are weighing a couple of kilograms. We saw no reaction from the Hotel and I think that is unacceptable! Breakfasts were very good! Location is perfect, close to the sea and bus stop. We had half-board - the food was delicious, wide choice, every day thematic dinner : spanish, south-american, oriental. 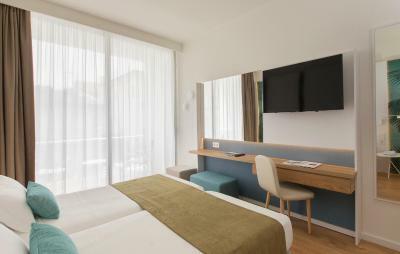 The hotel is very clean, definitely perfect value for money, loved the whole stay, very nice staff, would come again!